Songs to psych you up and soundtrack your SDCC. California Waiting by Kings of Leon – the theme song for those of us who travel from out of state to SDCC. Let’s Go by Matt & Kim – this song will get your early SDCC mornings off to a great start. It’s better than coffee. Radioactive by Imagine Dragons – You can’t escape this song, it has been used in numerous video games, TV, and movie trailers. Megalithic Symphony by AWOLNATION – this has video game soundtrack written all over it. What I’ve Done by Linkin Park – what’s summer and SDCC without a blockbuster action movie song? Done All Wrong by Black Rebel Motorcycle – one of my favorite bands and a song from the Twilight Saga soundtracks. Don’t Stand So Close To Me by The Police – because at some point someone is gonna invade your personal space during SDCC. Lead Me Home by Jamie N Common – amazing song from The Walking Dead soundtrack. All These Girls by Atlas Genius – because nerdy girls are not the same as other girls and you should own it! This Is Not An Exit by Beecake – you might recognize the lead singer of Beecake – Billy Boyd aka Pippin (my favorite hobbit) from The Lord of the Rings. Hold Me, Thrill Me, Kiss Me, Kill Me by U2 -- from the Batman Forever soundtrack (not the best movie in the franchise, but the song makes up for it). Moving Clocks Run Slow by We We’re Promised Jetpacks – after a couple hours in line at SDCC you start thinking the clock and the line is never going to move. Dancing On TV by Bad Veins – great song and the intro to the video has a fun tribute to the video games of our youth. Beast by Nico Vega – two words: Bioshock Infinte. 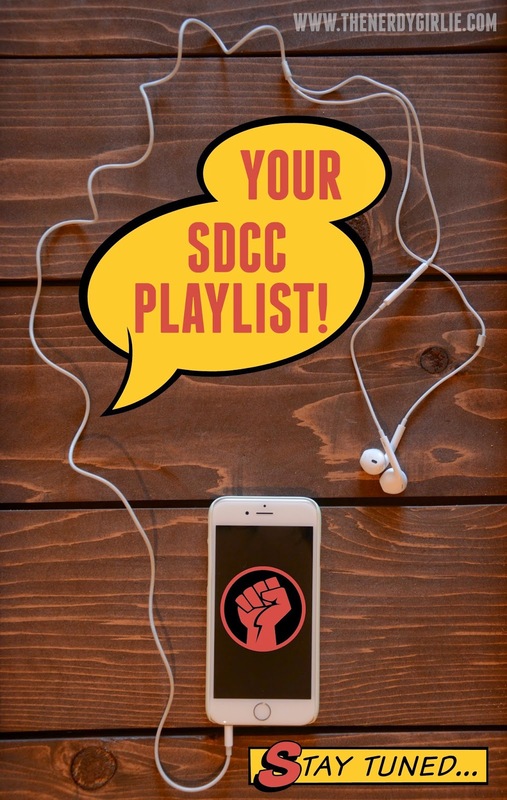 What songs are going to make your SDCC playlist??? Diamond Thrones by The White Panda is a must have for any GoT fans.